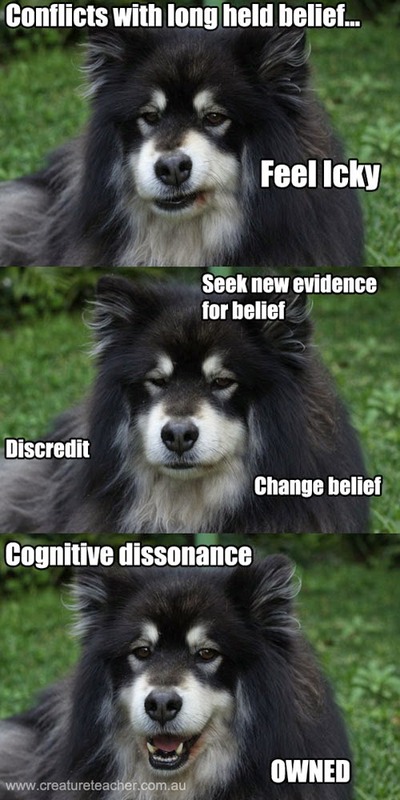 In a previous post, I described some common cognitive biases and how they may be relevant to animal training. In this post, I am going to focus on arguably the biggest reason why we believe the things we do, and why it is actually a pretty rubbish thing to base beliefs on. I am talking about personal experience. Personal experiences change the way you see the world. How many times have you heard something like "I wouldn't have believed it, except I saw it myself"? Have you said it yourself? I certainly have. When we have a memorable experience, we naturally become very convinced of it. It only takes one experience to make us into a believer. What happens when we are a believer? 1. We can change our beliefs and/or our actions so that they align with the new information. 2. We can seek new or revisit old information that supports our belief, thus increasing our conviction in it and reducing the conflict created by the refuting information. 3. We can discredit or downplay the refuting information, thus reducing its importance and the conflict it creates. EVERYONE feels cognitive dissonance sometimes. It is a good reason to be gentle with those that have beliefs that conflict with yours, and give them space to decide how they will handle the dissonance you have brought into their life. Memory is malleable - It is quite disturbing how malleable our memories are. Just asking someone if they remember something specific can result in them remembering it when asked again months later, even though it never occurred. False memories have been planted in people in several experiments using doctored photos, fabricated journal entries, and even just suggestion. See Loftus (2005) for a fascinating account. What we remember happening may or may not have actually happened. People are not very good at probability - We have a poor sense of what is likely and what is unlikely. Unlikely events can actually occur quite often purely by chance where there are large numbers involved. This means we will underestimate the occurrence of coincidences. People find meaning in meaningless stimuli - We are wired to find meaning and patterns. This is adaptive for us, but it also means we are prone to falsely identifying patterns, and linking two events together that may have actually been unrelated. For example, let's say I tried two training interventions at the same time, as well as homeopathy, and saw an improvement, which resulted in me believing homeopathy is effective, even though the improvement could have been a result of any number of things. 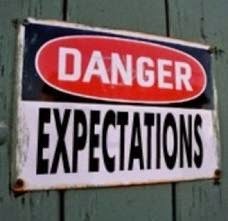 We see what we expect to see - Expectation biases prime us to see or hear what we expect to. If I go into an internet discussion, and you are used to disagreeing with me, you will see evidence of my stances you disagree with in what I say, regardless of whether I was thinking about them when I typed my message. This one is particularly dangerous in animal training, because we wouldn't use an intervention we didn't expect to work. Things have relative meaning to us - We will tend to give things meaning by their relative relationship to other things we know rather than judging them on their own merits. We we will tend to make decisions based on how the information is presented to us, which is known as the framing effect. For example, we could be given the same two choices, but phrased in two different ways, and we might make different decisions based on how the choices were framed. You would think that you would make the same choice every time, but you pick the one that SOUNDS better rather than the one that is logically better. So, there are a bunch of cognitive things we do that aren't so reliable. So what? I still know what I saw. Science doesn't know everything. And my experiences are valuable. Yep, that is your cognitive dissonance talking. Do you know what you saw? Really? Hopefully this article has made you question that, because you should. It is the exact reason why we have a careful and thorough scientific method. Because it is SO HARD to be free of bias. No, science does not know everything, but where there are data and they are of good quality and have been analysed well, we really have a responsibility to think about changing our beliefs if that data conflicts with them. Those data were collected because our personal experiences are unreliable. The data are supposed to be more reliable. And, of course your experiences are valuable. Most especially to you! Studies have been conducted based on personal experiences, and this is a wholly acceptable reason to conduct a study. But, the point is to find out if the personal experiences are true, or just a factor of bias or misinterpretation. Nonetheless, oftentimes in training we don't have scientific data. We only have personal experiences. What should we do? Be as sure of your personal experiences as you can be! That means objective recordings of baseline behaviour so that progress can be tracked throughout treatment. It is tedious, and I am yet to convince a client to do it, but numbers are more convincing than your subjective experiences. Wicklund, Robert A., and Jack Williams Brehm. Perspectives on cognitive dissonance. Psychology Press, 2013. Lommen, Miriam JJ, Iris M. Engelhard, and Marcel A. van den Hout. "Susceptibility to long-term misinformation effect outside of the laboratory. "European journal of psychotraumatology 4 (2013). Loftus, Elizabeth F. "Planting misinformation in the human mind: A 30-year investigation of the malleability of memory." Learning & Memory 12.4 (2005): 361-366. Gigerenzer, Gerd. Calculated risks: How to know when numbers deceive you. Simon and Schuster, 2002. Rozenblit, Leonid, and Frank Keil. "The misunderstood limits of folk science: An illusion of explanatory depth." Cognitive Science 26.5 (2002): 521-562. Tuyttens, F. A. M., et al. "Observer bias in animal behaviour research: can we believe what we score, if we score what we believe?." Animal Behaviour 90 (2014): 273-280. Levin, Irwin P., Sandra L. Schneider, and Gary J. Gaeth. "All frames are not created equal: A typology and critical analysis of framing effects. "Organizational behavior and human decision processes 76.2 (1998): 149-188.